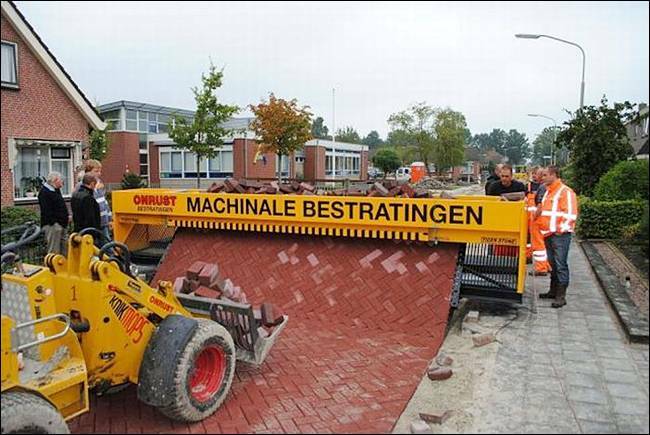 Here’s an interesting way to overcome some of the objections from the emergency services to traffic calming. An article by Garcia and Moreno in Asfalto discusses the use of a traffic calming measure called a speed kidney in Valencia, Spain. A speed kidney offers drivers the choice of deviating and slowing from a straight path or crossing a raised section of roadway similar to speed hump operation. On a practical level some expertise would be required to construct these which might make them expensive. Anyone in the USA want to try them? A very innovative idea. It will be interesting to see if anyone tries it. Lots of traffic calming projects make extensive use of paver blocks. How good is this machine ?. 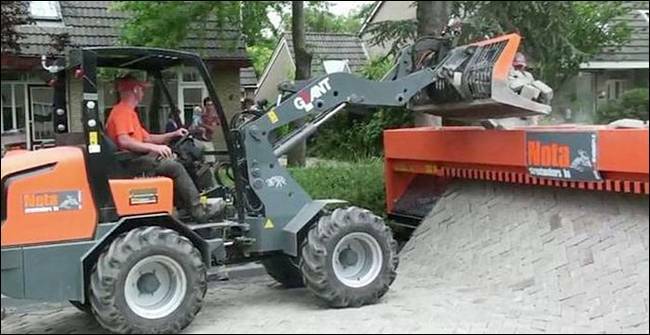 No end to man’s ingenuity. 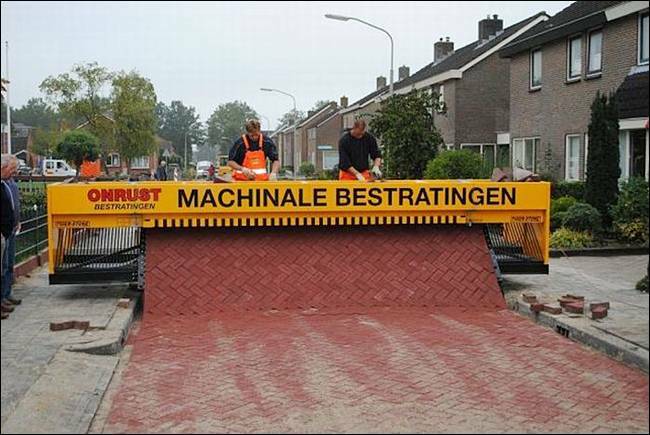 Tiger-Stone is a Dutch paver laying machine that can produce brick roads. 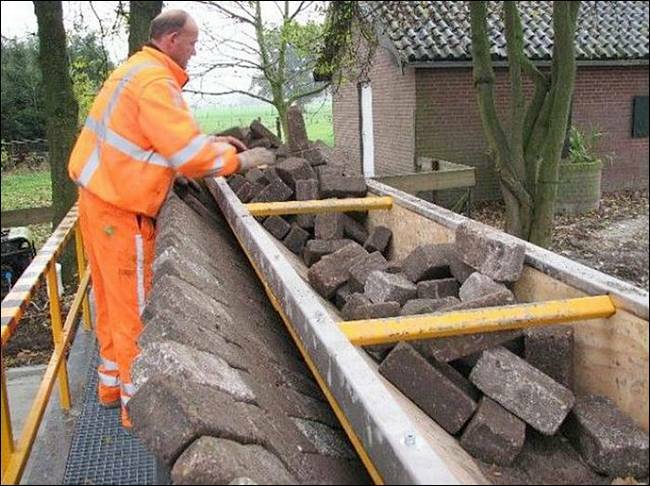 Paving bricks are dropped by front-end-loader onto the angled trough. Men help to spread them in the trough as they drop into the forming jig. 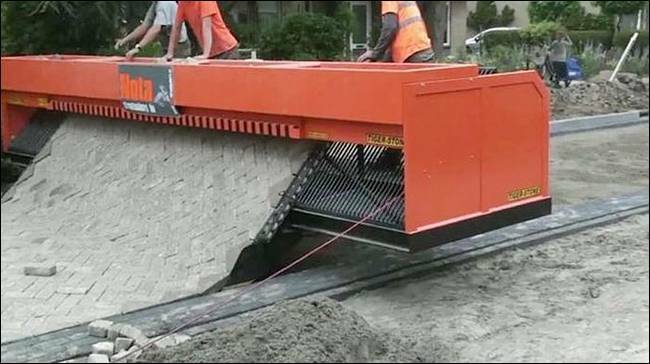 As the electrically operated crawler moves forward along a pre laid sand base layer, all the stones are packed, gravity held together & descend the sloping ramp on to the road. Not traffic calming but an innovative intersection design for arterials crossing freeways. Apparently used by the French. These photos have been making the rounds. Has anyone actually used these on public roads. I doubt it! The Traffic Engineer for the City of Lakeland [David Uria] has undertaken a survey of Florida municipalities to determine the criteria in use to justify traffic calming meaures. A copy of the results summary is attached. It’s interesting that they’re generally based on a combination of traffic volume and speeding. There’s general use of a criteria of 85 percentile speeds in the range 5 – 10 mph above the posted speed limits. Traffic volumes vary widely. The table would be a good starting point for someone drafting traffic calming criteria. My traffic calming site has now been available for several years. It is clear that traffic calming is more than a passing fashion and is now being widely used. It is less clear, however, which traffic calming measures should be used in any given circumstances; or indeed if any traffic calming is necessary or appropiate. Public officials are often under a great deal of pressure to undertake traffic calming [at sometimes great expense] to address a perceived community problem. The current state of the art in traffic calming is in need of criteria or guidelines for when traffic calming is most necessary. Speed humps often yield the ‘most bang for the buck’ and are frequently requested by the public. Criteria for when they are appropriate are needed. To further this debate on the need for traffic calming and ,in particular, speed humps, I am attaching a set of criteria which I drafted and have been in use for several years. Cyclists to Soar above in London?